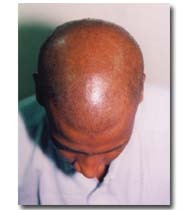 Alopecia Totalis, one among the hair problems we meet in our day-to-day practice. Perhaps many homoeopaths give importance in treating a skin disease rather than a hair problem, since it is frequently concerned with cosmetic orientation. 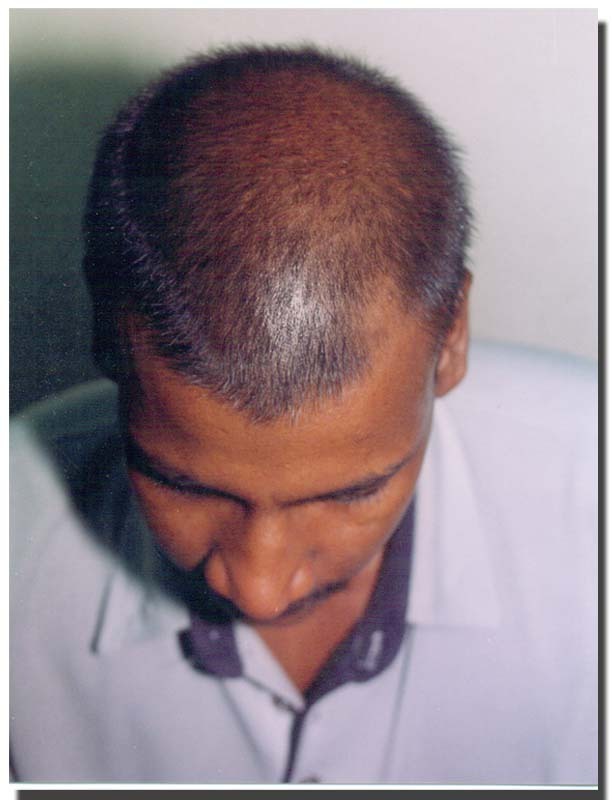 Here the author had presented a case of 'alopecia totalis' treated with Fluoricum Acidum and Acid Phosporicum. Good hair growth and the case were cured. He has given visual impacts to support his therapy. A young boy entered my chamber wearing a cap. 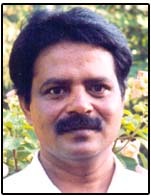 His registration form showed that he was around 23 years and working in a chemical industry. He sat on the chair and looked at me removing the cap from his head. 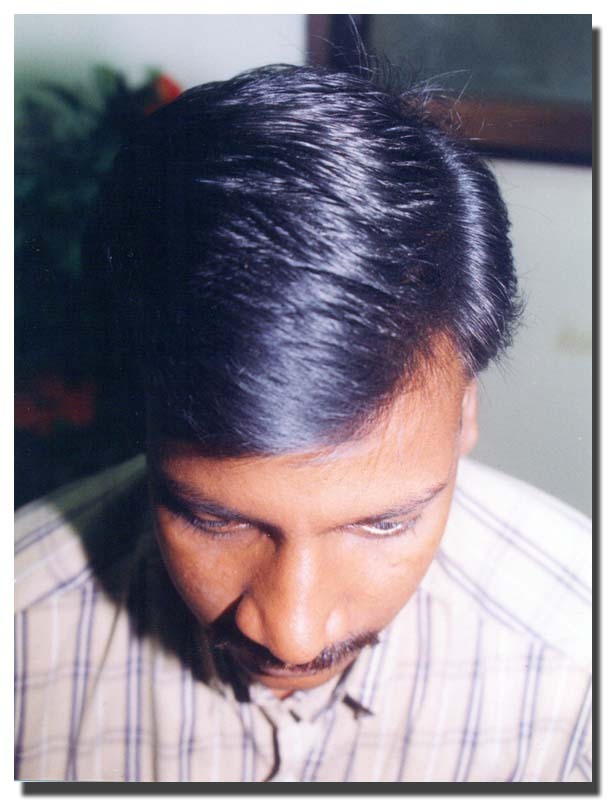 "I lost my hair all over since one and half years"
The scalp is shiny, smooth and few strands of feeble brown invisible hairs here and there. He looked anxious, nervous and worried. "First I had fever for more than a month and my family doctor treated it as typhoid fever. 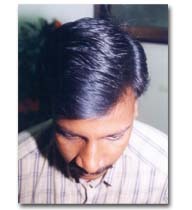 The fever stopped, then my hair started falling profusely; I applied some oils; then I consulted an Ayurvedic Doctor. He prescribed some hair oils and medicines, No use! Almost I lost my hair all over my head at that time. 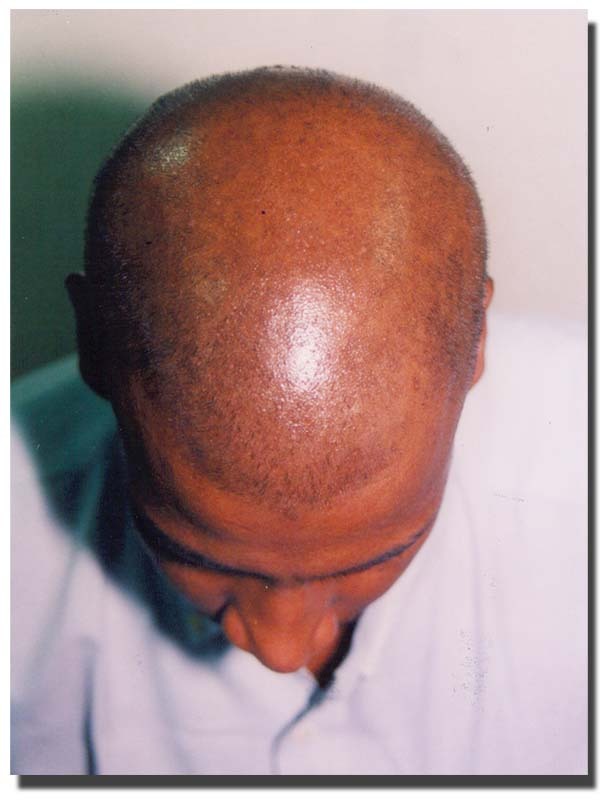 One of my friend advised me to consult a skin doctor; I did and he gave some lotions and prescribed some medicines"
He showed me a prescription for some medicines bearing with diagnosis of Alopecia Totalis. "Nothing! I catch cold on and off; that too goes with a matter of three or four days"
How is your Appetite and Bowel habit? Where do you sweat more? "I sweat more on the forehead"
What type of food do you like more? He is lean, tall prefers cold climate .not a smoker or alcoholic, prefers coffee and tea, has nail biting habit. I recorded all his symptoms with my computer for statistical purposes. Dark, black hairs all over the head. 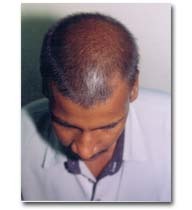 This case is a clear picture of Alopecia Totalis by its mere visual impact alone, having aetiology either due to the toxins liberated during the course of fever or long termed bad effects of the drug. Here the location is scalp, no sensations and modalities.Based on the therapeutics and indications I prescribed Fluoricum Acidium 1M because it well indicated for the bad effects of fever, especially in typhoid fever. The symptom similarity also fits the remedy well. Acidium Phosphoricum Q was used as complementary remedy and well indicated in" Debility " as he was suffered with mental and physical exhaustion.